← What is the perfect education? As winter is upon us, I am once again drawn to the best book, The Poet’s Dog. Fall in love with a dog, a poet, and children- magnificently written, through the voice of the dog. A winter storm has arrived here in New England, so yes, I’ll be reading this book. Sylvan the poet constantly reads to Teddy. He reads Yeats and Shakespeare. He also reads Charlotte’s Web, The Lion, the Witch and the Wardrobe, and Ox Cart Man. Teddy learns how words follow one another. I had no idea that Ox Cart Man, one of my favorite children’s books, is actually a poem. I scrambled to find my copy and read the words again, this time seeing the words for what they are meant to be – a poem. When I read the book again to my preschoolers this month, it will be more beautiful than ever. The Poet’s Dog is a story of adventure, survival, love and friendship, death, reading and poetry. The beginning is a fishing line that hooks the reader, and the ocean opens to… well, you will have to read the book The ending is as surprising as ever. She smiled a knowing smile. I did, too. P.S. Dogs: Maddie, Ollie, Ani, Twiggy and Lucy… and more – tell your human to read this book. This is your second reminder, so be firm this time. Really! This entry was posted in Book Review, books, chapter reading, Dogs, Imagination, joy, Kindness, Love, Particia MacLachlan and tagged Book Review, children's books, Dogs, Early Education, literacy, Patricia MacLachlan, The Poet's Dog. Bookmark the permalink. Thanks for the new reminder, it sounds like a book adults would enjoy too. I think perhaps adults enjoy it most of all. Really. Thank you, GP. i’m going to read this, i’ve never heard of it. thanks! Oh, Beth, you will LOVE this book. Promise. I’m so glad! Do you know her award winning book, “Sarah Plain and Tall”? This is as good, if not better. Beth, it should have won the Newbery. Thank you, Ollie. 🙂 Best to you, Pete. Great review. I’ll get it to read…if I can ever get out of my driveway. Yes, big snows here, too. Stay warm and cozy with your book(s). Thanks, Steve. We have 6” of snow now, and the ice is coming down. Ugh! Snowblow, read The Poet’s Dog, and watch the Patriots. I’m not familiar with this one Jennie but I love the whole idea of it! I will have to get it! You will absolutely love this book, Opher. Promise. I will have to read this book, Maddie agrees. Our animals speak to us all the time. It is one of the best, Dan. Thank you for nudging him, Maddie. Annika, on this book, I believe it is really far more than a book for children. Adults are moved beyond words, and the ending is outstanding. So, I’m glad you’re planning on reading it! Thank you for your kind words. 🙂 And, may the child in us flourish! Now I understand why some people cannot hear what the animals say. Thanx Jennie! I do know that, Darlene. 🙂 She is a terrific author. I adore Sarah, Plain and Tall. 🙂 An adorable post, Jennie. The book sounds marvelous. Stay warm! Hugs on the wing. It definitely is!! Many thanks, Anneli. I wish we could all stay innocent children all our lives. This is lovely. We need more books like this. Twiggy and Lucy did as they were told. I must read this book or answer to a higher authority. Super post, Jennie. We just read “The Poet’s Dog” the first week of January and 5 year old, Benjamin, loved Teddy. Yesterday we began Chris Britt’s “The Most Perfect Snowman”. Benjamin has been so hoping for snow and Winter Storm Harper held great promise for this little corner of New England, but the long awaited snowflakes too soon became a rain sodden mess. The only snowman here will be found in the pages of the book. I always enjoy your posts about the books that you choose and enjoy, your inner child peeks through! “The secret of genius is to carry the spirit of the child into old age, which means never losing your enthusiasm.” – Aldous Huxley. Thank-you! Thank you, Ellen. Tell Benjamin I love Teddy, too. 🙂 The Perfect Snowman would have been ‘perfect’ had the weather forecast cooperated. But, that’s New England. I’m glad that my inner child peeks through when I write about children’s books! I adore the Aldous Huxley quote!! It’s going to be added to my list. Jennie, thank you for this lovely recommendation! This book is right up your alley, Charles. The Poet is an English professor. He has a true understanding of words, and how he reaches out to his students reminds me of you. I’m not quite sure why this is classified as a children’s book. Honestly, you should read it aloud to your students. Really. Best to you, Charles. You are most welcome, Charles! Here is a lovely book recommendation from Jennie, that excellent teacher! Thanks so much for introducing me to this book. Can’t wait to read it! A beautiful book, Jennie. I have just bought the audiobook. Thank you, Robbie. I have not heard the audiobook, I can picture those words read aloud! I will let you know what I think of it. I’m so glad! Thank you, Robbie. Have you recommended this one before, Jennie, or did I find out about it from Patricia Tilton? It does sound very special and perfect for reading in your snow storm. I’m sure you and your children will enjoy. I think you’d remember the story if you had read it. Let me know. Thanks! Jennie, I finished it this morning. I agree you. 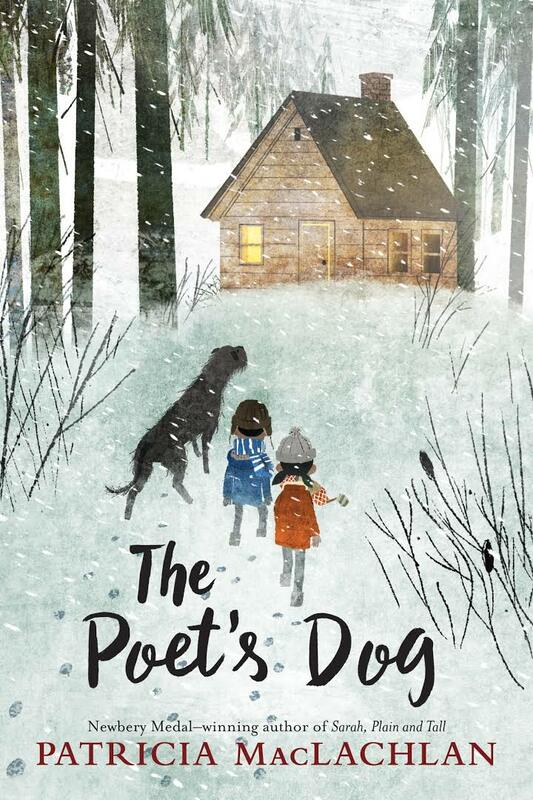 ‘The Poet’s Dog’ is a beautiful story, so heartwarming and poignant. I’m so disappointed that I was distracted earlier, but that disappointment becomes joy upon reading it now. I absolutely love the conclusion. The book is a true gem. Thank you for reminding me of it. I’m so glad you read the book and felt the same way as I did, Norah. The ending was far more poignant and wonderful than I expected. A true gem! It is one of the best. Thank you! This one is a winner, Robin! Wow! I’d never heard of this book though I’ve read others by Patricia MacLachlan. (Sarah, Plain and Tall being a favorite.) Thank you for yet another great book recommendation. Sarah, Plain and Tall is a favorite of mine, too. The Poet’s Dog is as good, if not better. It should have won the Newbery. Thanks so much, L. Marie! What a delight for me to have found your blog!! I am so glad you have found my blog! This is truly one of the best books. Teaching children must be the most rewarding thing, Jennie. 🙂 🙂 Thanks so much for finding my blog. It definitely is one of the most rewarding things. Reading aloud to children tops the list. Thank you! Norah asked my question and you answered it. I knew it was familiar when I saw the cover. It’s a sweet story. I’m glad you remembered, Marlene. I needed to shout out about this book, as it had been two years. The snowstorm was just what I needed to read the book again. I’m so glad I did!! This goes straight you TBR list, Jennie! Thanks! I’m glad! 😀 You’re welcome, Sarah. Thank you, Robbie! Your kind words are certainly appreciated. I’m so glad you like the Poet’s Dog as much as I do. I often feel as though I learn much about British children’s books from you. The library just found Winnie the Witch for me, which I’m very excited to read. Thank you for your kind words, Robbie. And thank you for linking the post to your blog. I feel like I learn about wonderful British books from you. My library just got me a copy of Winnie the Witch. I’m excited to read it. Hi! I appreciate your invitation. Although I write a blog and have written a children’s book, I am not a published author. And, being a preschool teacher, my area of expertise would have been your January theme. Please keep me in mind down the road. Thank you!